John Lydgate (c.1370-c.1450) was probably born at Lidgate in Suffolk; he became a monk of Bury St. Edmunds aged 15, a priest in 1397, and during a long life was a remarkably prolific writer of English verse. 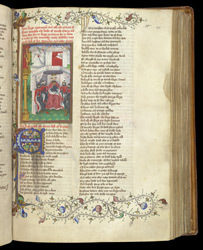 This manuscript was written and illuminated in two stages: heraldic evidence suggests that it was begun around 1460, but many of the spaces left for miniatures were left blank. About 60 years later, c.1520, the blank spaces were filled, and further Lydgate texts were added at the beginning and end. In the foreground of this miniature Agamemnon sits with the princes of Greece, while in the background Achilles lies in bed, wounded. The rubric reads (with the spelling modernised): 'How King Agamemnon and all the princes of Greece rejoiced the defeat of worthy Hector, and how they sent to King Priam for to have a truce of two months, while Achilles were made whole of his wounds, and other princes'.